My bedroom walls were looking a little plain & sad so I decided to make some simple pieces to bring in some fun & color to our bedroom this past weekend. My first instinct would be to paint the walls but because we are renting I have to think of other ways to brighten up the boring tannish walls. 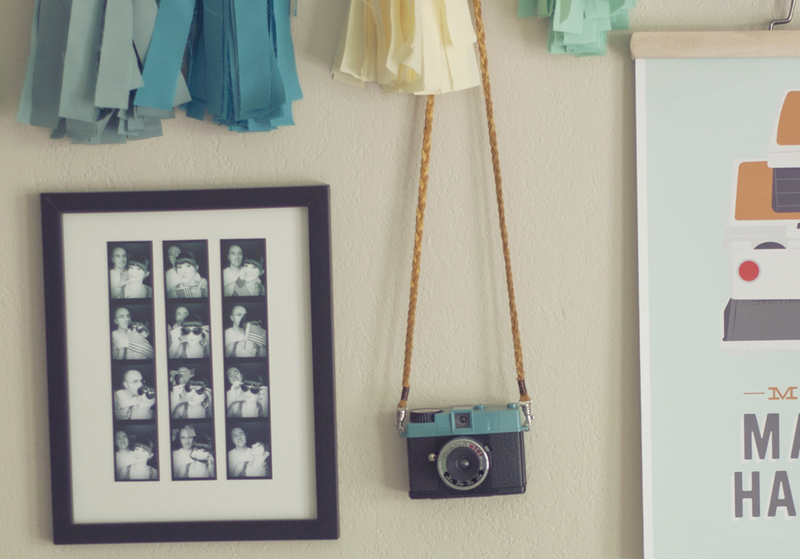 I am on a pretty non-existent decorating budget so here are some simple, inexpensive ideas to jazz up your walls. 1. 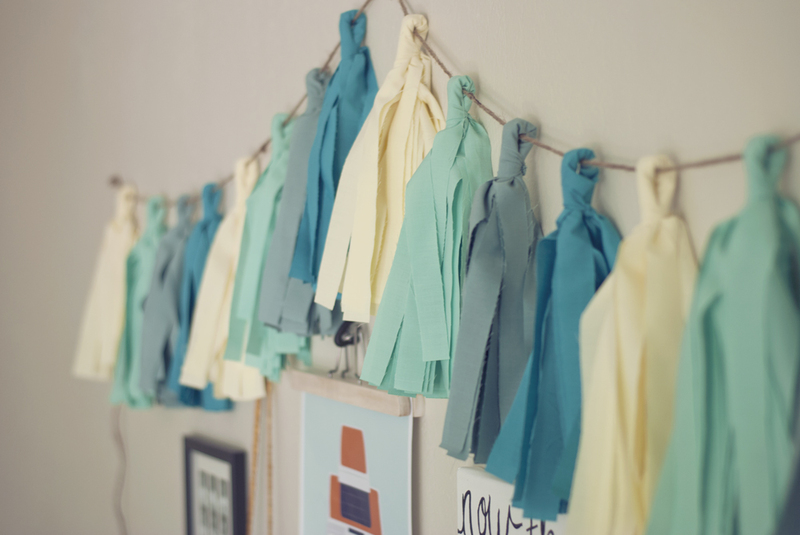 Fabric Fringe Garland - I posted this fringe garland diy (by Prudent Baby) on my recent Fringe Frenzy post. It is a super simple no-sew diy. I chose 4 cotton solid fabrics from Hobby Lobby & got 1 yard of each (I think they were only a couple of dollars per yard). I cut my fabric 18 x 22 inches to get exactly 4 tassels from each yard. 2. Framed Photo Booth Photos - I cheated & used the IncrediBooth iphone app to take these photobooth strips (real photobooth photos would be even better!). I printed them out on my home printer & cut them out. I attached them with double stick tape to a white mat board & used an 8 x 10 frame I had on hand to display them. I love that it will be easy to change them out with new photo strips as time goes on. 5. Written Word Wall Canvas - I bought this blank canvas from the craft store (for 50% off) awhile back with a few different projects in mind. 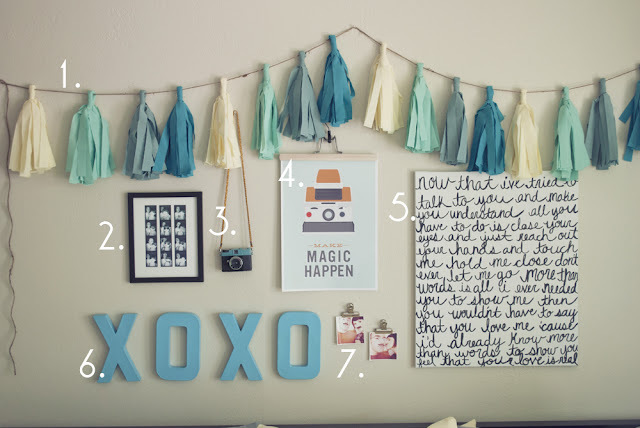 I originally saw this idea on pinterest & thought it would be perfect for this grouping. I used a black paint pen that I had in my craft supplies. 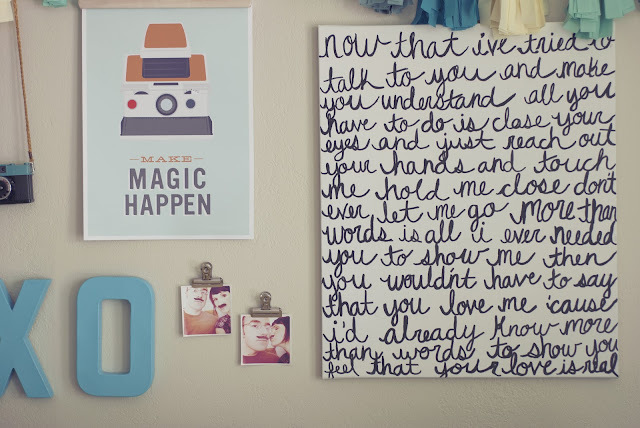 I chose some of the lyrics from the song "More Than Words" by Extreme, we danced to this song at our wedding & now it serves as a permanent reminder over our bed that actions mean so much more than words. Showing we love each other is just as important as saying it. 6. Painted Letters - Ridiculously simple - I just got the cardboard letters from the craft store & painted them with blue acrylic paint. I cut out a small hole in the back to attach them to the wall with a push pin. 7. Metal Photo Clips - I had these small metal clips on hand, found in an office supply store or the office section of Target. I hung them on a small nail. I love changing out photos & little notes so I thought these would be perfect! The photos were taken with the Hipstamatic app & printed out on our home printer. it looks great, lady! that garland is amazing and those color choices! 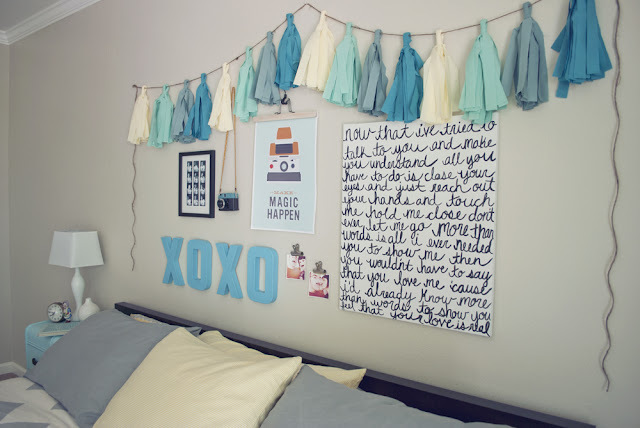 such a good idea for renters [or me because i'm too lazy to re-paint]. i made a painting just like that one from another blogger who used that same pinterest picture! i made mine a little more smashed like that picture and i kind of regret it because you should see everyone stop in front of it and try and read it. i usually just give up and say, "IT'S SWING LIFE AWAY BY RISE AGAINST NOWMOVEALONG." hah. it looks so great! i hope creed [your husband, not the band, duh] loves it! Thanks, friend!! I totally had the intentions to make mine all smashed, too. BUT.....I'm way too much of a control freak & I just couldn't do it. ;) Creed the husband LOVES it or so he says....ha! this is incredible!! I am especially loving the photobooth pictures. downloading that app right now! absolutely gorgeous! i'm thinking a little bedroom artwork is needed in my near future. eventually we're in need of a larger design but right now that feels like it's a million years away. 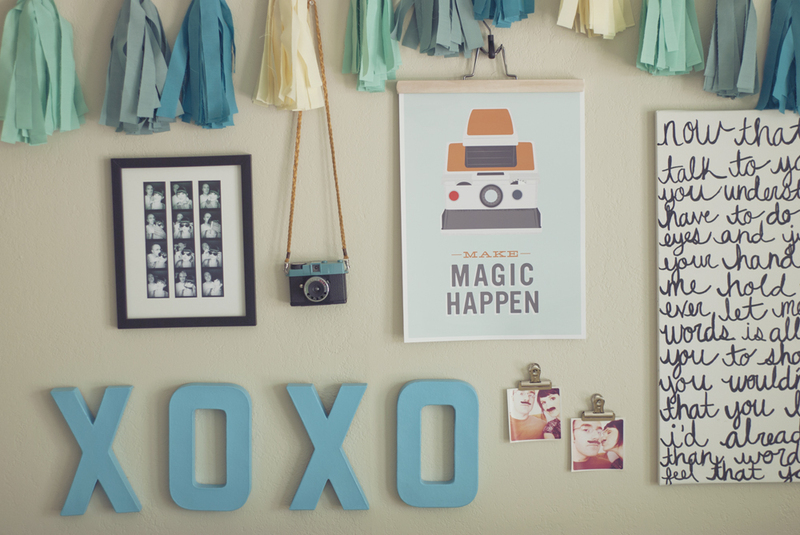 some homemade artwork can work wonders - thanks for the inspiration! Thank you! It's amazing what a few easy pieces can add to a room! 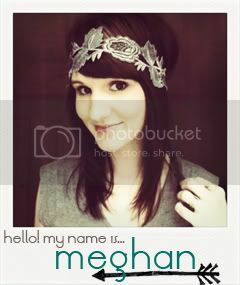 Awwww Meggy, it is so pretty, and relaxing!!! I love it!!! Thank you sweet friend! xo. I LOVE IT! 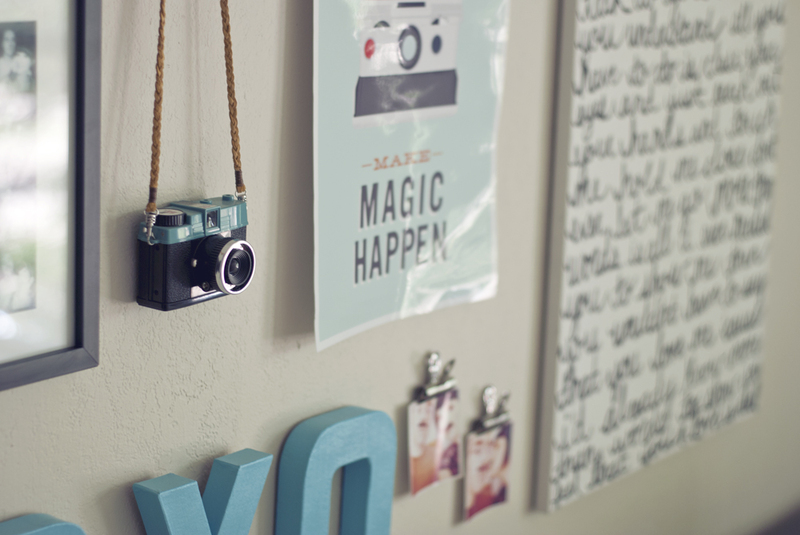 So inspired to redecorate my room now :) Can't wait til i have the time to! Thank you!! :) It's amazing how a few changes can make such a big difference! I love this post. So many cool ideas that have inspired me and also thanks for the incredibooth tip. I've never heard of them before but can't wait to try it out! Love this! You should have a separate post about the garland. Although, you did use pretty prudent's Idea, I like the way yours look a bit more! I love this! You should do a separate post on the garland. Although, you used pretty prudent's idea, I like yours a bit more!